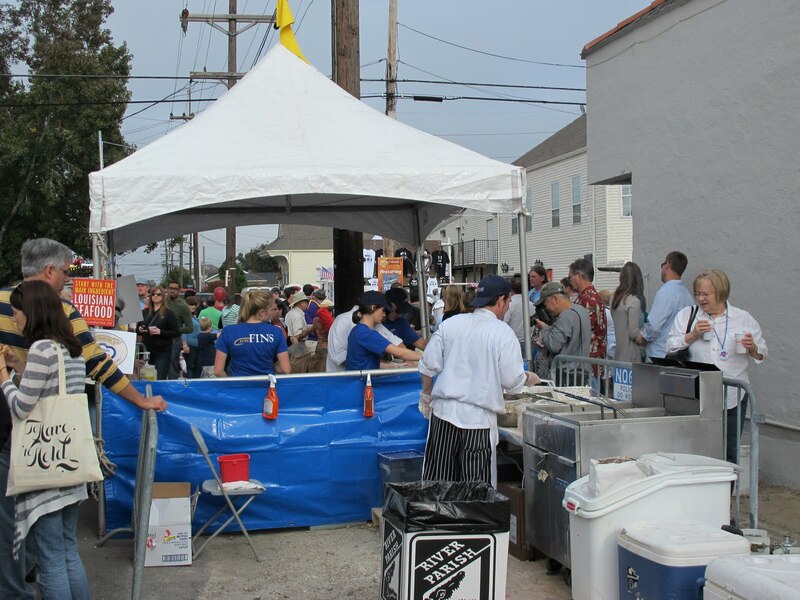 I wasn’t really prepared for the madness of this year’s Po-boy Preservation Festival. I knew the 2009 Festival was a success and it got extra publicity from a write up in the New York Times courtesy of John T. Edge. However, I just wasn’t expecting the sheer mass of people that I would meet on Oak Street last Sunday. Driving down from Jackson, I thought arriving there around noon would give me plenty of time to scope out the booths and plan my attack. Unfortunately, once I exited onto Carrollton, I saw that almost 10 blocks away, people were parking and walking to Oak Street. I eventually found parking on River Bend at the end of Dante Street and walked into what would be one big line. Wouldn’t you know the first line I got in was one of the longest? It was the line for GW Fins and their Fried Maine Lobster Tossed in Crystal Hot Sauce Po-boy. 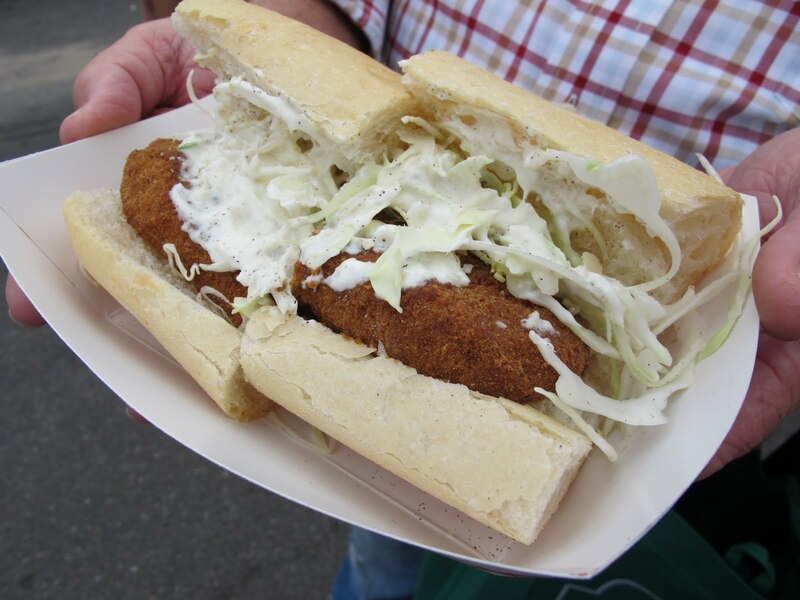 After nearly an hour long wait, I finally had one of these elusive lobster po-boys. This was a good po-boy but considering the wait, it was anticlimactic. The problem was they could only fry so much lobster at once. As soon as the man behind the fryer had a batch ready, it was tossed in the sauce. 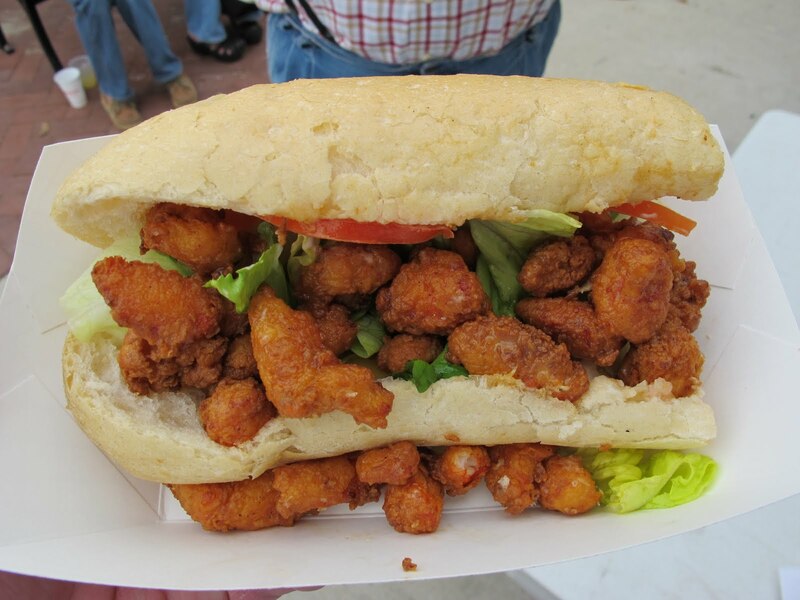 and was passed to the po-boy assembly line. With my traveling companion holding our spot in the GW Fins line, I made a game out of how many po-boys I could bring back before we actually got the lobster po-boys. 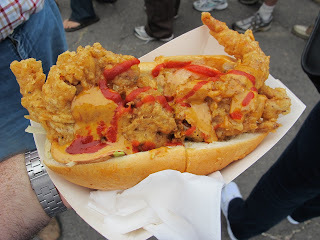 Here’s a soft shell crab po-boy from Ninja and topped with homemade spicy mayo and a little extra sriracha, it was dynamite. 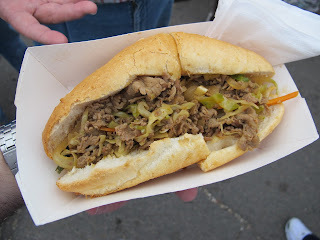 I also picked up a Yakiniku po-boy. The sign said it had thin sliced ribeye and veggies sautéed in spicy garlic sauce. It may not have been spicy but it was very good. Still having time to spare in the GW Fins line, I also made it to the Saltwater Grill Tent. 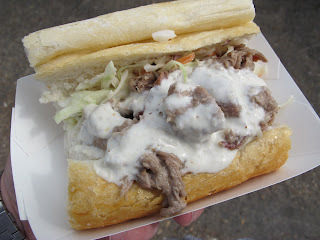 Yep, I went straight for that Cochon de Lait Po-boy. The pork was certainly juicy but I was hoping for more bite from the horseradish cream sauce. 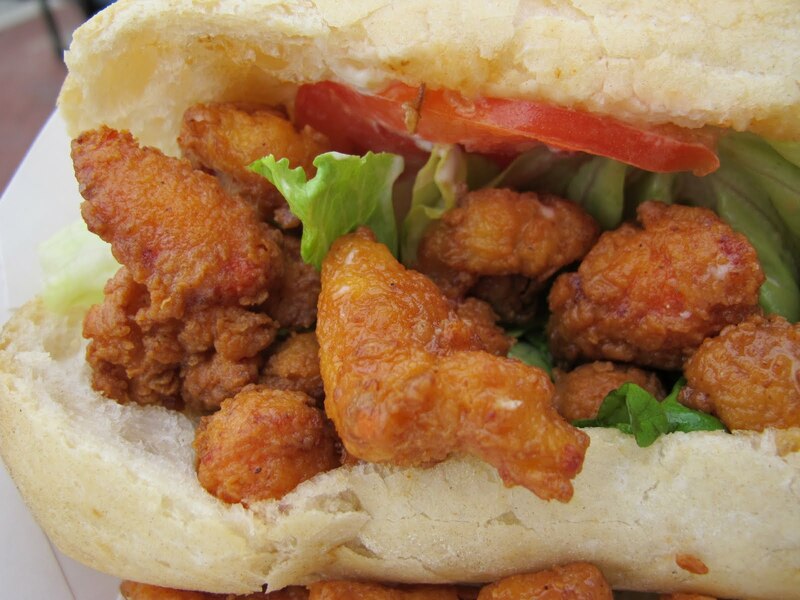 This po-boy was good but salty. After that I had to go across the street to Emeril’s Delmonico. 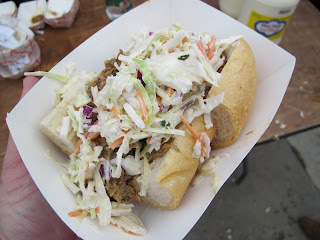 How can you turn down a Confit pork cheek po-boy with dirty rice aioli and southern-style cole slaw? Breaking away from the po-boy trend, I went with something different from Jack Dempsey’s Restaurant. 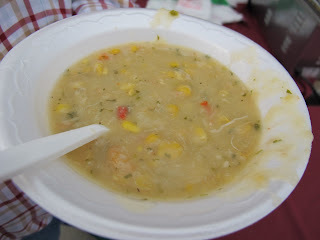 Shrimp, crab, and corn bisque and it was excellent. I was nearing my limit, but I knew I had to try what Grand Isle had to offer. 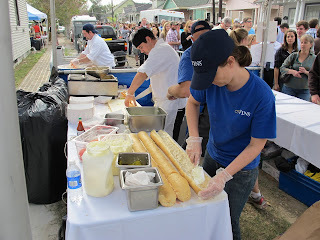 Their boucherie po-boy had a little bit of everything on it. 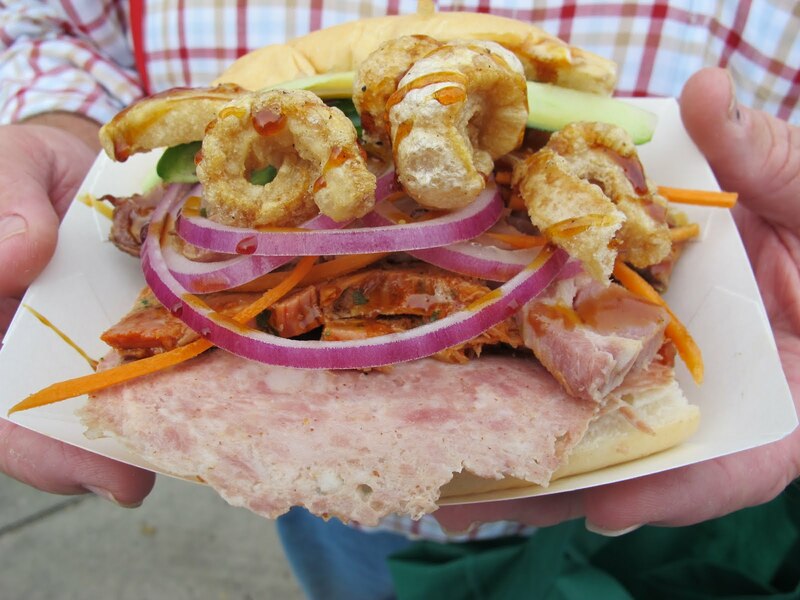 Pork cracklings, house made bologna, head cheese, cucumbers, carrots, red onions, and molasses all made for a staggering po-boy. I wish I could say that I had tried more po-boys but when I tried to walk back to Carrollton, I was just overwhelmed. 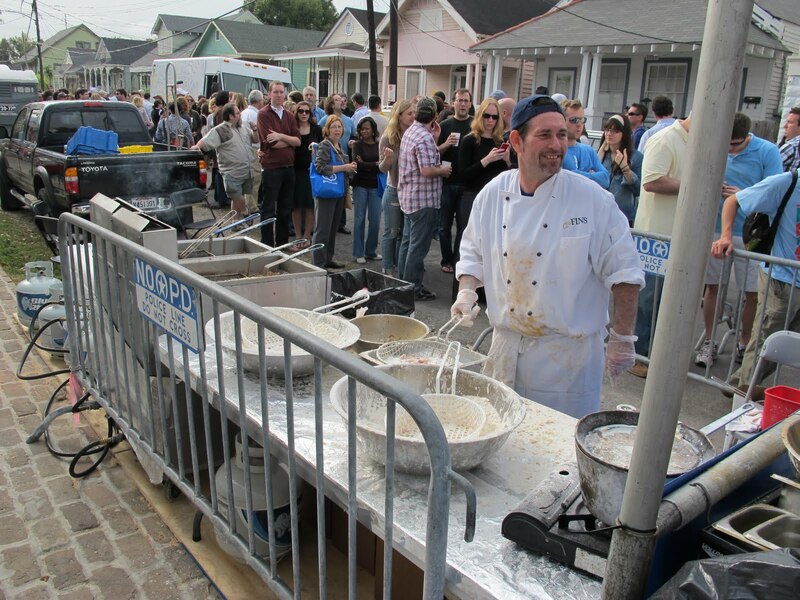 In front of Jacques-Imo’s, it was a complete standstill. From there to the beginning of the festival, it was a solid wall of people and lines which meant I was quickly separated from my companion. With no cell phone service and running low on patience, energy, and funds, I decided to walk back to the car. Fortunately, my companion had the same idea. 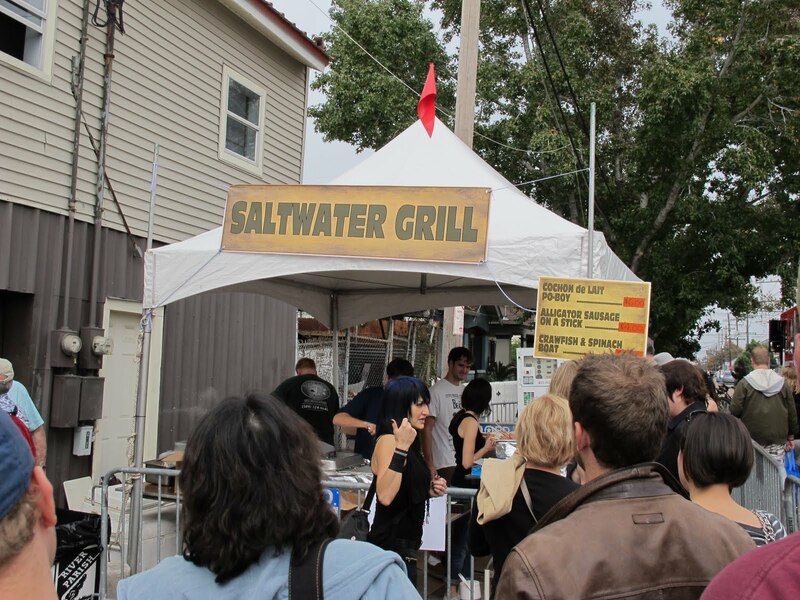 Even though there was another two hours to the festival, I couldn’t bring myself to go back and stand in line. The 2010 Po-boy Preservation Festival was fun, but the crowds were a nightmare. That being said, I’m already planning for next year. Looks like you got some really good ones!